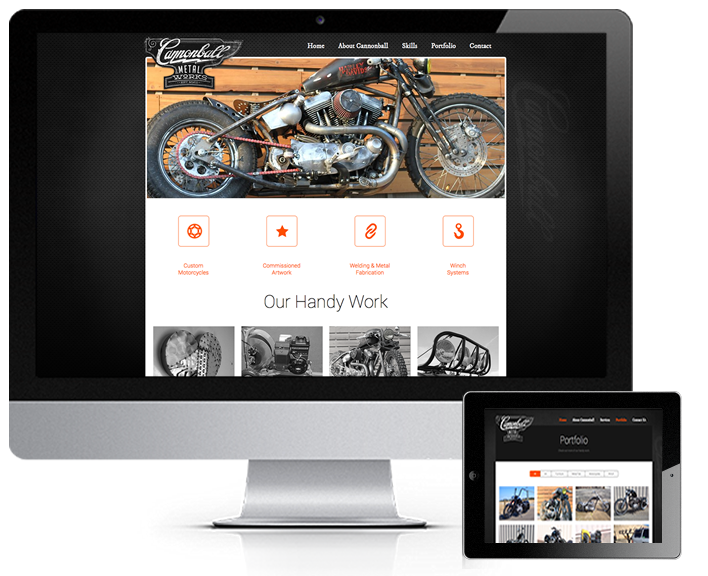 In 2005 Ryan Schuppert started his own shop called Cannonball Custom Cycles and had a basic entry-level website that allowed him to keep his portfolio updated on line, but that was about it. Many bike show awards and custom motorcycles later, Ryan decided it was time to expand his business into something more than just motorcycles and he recognized his website needed to expand with it. Now the shop is called Cannonball Metal Works where he also does some amazing metal art work, custom furnishings, Pulldozer Winches and general metal fabrication. Ryan is a busy guy so he needed a website solution that wasn’t going to take up much of his time and still easily allow him to make updates and keep his portfolio current. He also needed a great portfolio solution to show off his work and a mobile responsive website that looked great on any device was an absolute must. Tumbleweed Creative is an excellent design firm. They do a great job of listening to your goals and needs, while still bringing their own creative force to create an amazing product. They keep in touch, respond to emails and phone calls, and stay on schedule. All in all we couldn’t have asked for more in designing our website and app.